Mongolia is a landlocked sovereign state in East Asia. Its area is roughly equivalent with the historical territory of Outer Mongolia, and that term is sometimes used to refer to the current state. It is bordered by China to the south and Russia to the north. Mongolia is the 18th largest and the most sparsely populated fully sovereign country in the world, with a population of around 3 million people. It is also the world's second-largest landlocked country. The country contains very little arable land, as much of its area is covered by grassy steppe, with mountains to the north and west and the Gobi Desert to the south. Sea turtle and mollusk fossils have been found in the Gobi apart from the more well-known dinosaur fossils. Ulaanbaatar, the capital and largest city, is home to about 45% of the country's population. The Mongols gained fame in the 13th century when under Chinggis KHAAN they established a huge Eurasian empire through conquest. After his death the empire was divided into several powerful Mongol states, but these broke apart in the 14th century. The Mongols eventually retired to their original steppe homelands and in the late 17th century came under Chinese rule. Mongolia won its independence in 1921 with Soviet backing and a communist regime was installed in 1924. After the anti-Communist revolutions of 1989, Mongolia conducted its own peaceful democratic revolution in early 1990. This led to a multi-party system, a new constitution of 1992, and transition to a market economy. The official language of Mongolia is Mongolian, and is spoken by 95% of the population. Today, Mongolian is written using the Cyrillic alphabet, although in the past it was written using the Mongolian script. Russian is the most frequently spoken foreign language in Mongolia, followed by English. 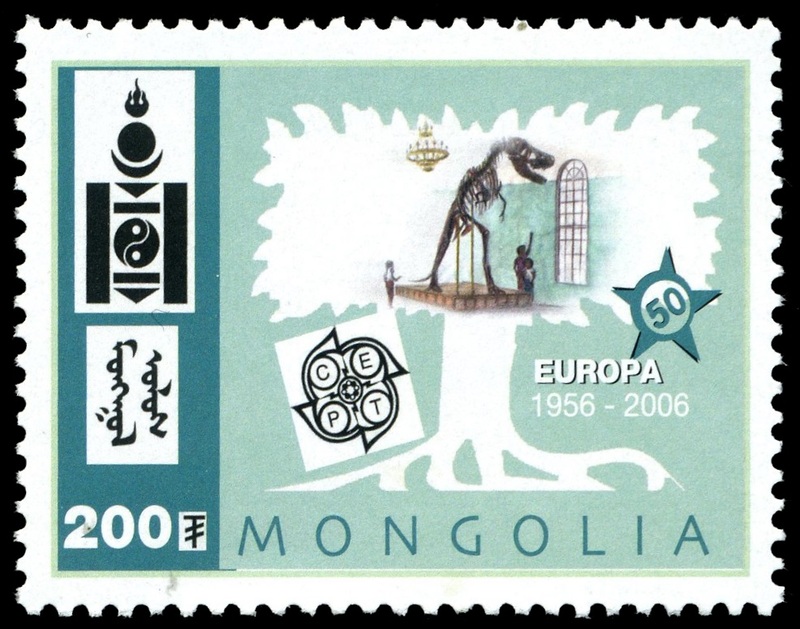 The first stamps used in Mongolia were those of Russia from 1858 who operated a number of post offices in the country. The first stamps of Mongolia were issued in August 1924., but still has Cyrillic text on it. Click on image to enlarge it or be redirected on description page, when exist. 31.03.1967 "Prehistoric Animals" 07.05.1977 "Prehistoric Animals" 25.08.1990 "Dinosaurs"
30.11.1994 "Prehistoric Animals" 05.10.2000 "Millennium of Exploration"  01.07.2001 "Japan: Expo 2001"
 In February 2006 Post Authority of Mongolia issued a set of 12 stamps "50 years of EUROPA stamps" shown various sightseeing of the country. Stamps issued in several formats: Mini Sheet with all 12 stamps, 12 Mini Sheets 12 stamps each with the same stamps, 6 Blocks of 2 stamps each, boths perforated and imperforated. 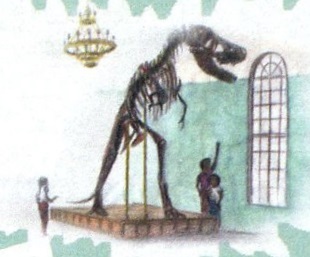 One of the stamps shows fossilized skeleton of Tarbosaurus battaar -the most famous dinosaur of Mongolia. Tarbosaurus is a genus of tyrannosaurid theropod dinosaur that flourished in Asia about 70 million years ago, at the end of the Late Cretaceous Period. Fossils have been recovered in Mongolia, with more fragmentary remains found further afield in parts of China. Although many species have been named, modern paleontologists recognize only one, Tarbosaurus bataar, as valid. Some experts see this species as an Asian representative of the North American genus Tyrannosaurus; this would make the genus Tarbosaurus redundant. Tarbosaurus and Tyrannosaurus, if not synonymous, are considered to be at least closely related genera. Alioramus, also from Mongolia, is thought by some authorities to be the closest relative of Tarbosaurus. Charles Darwin shown on one of the stamps. 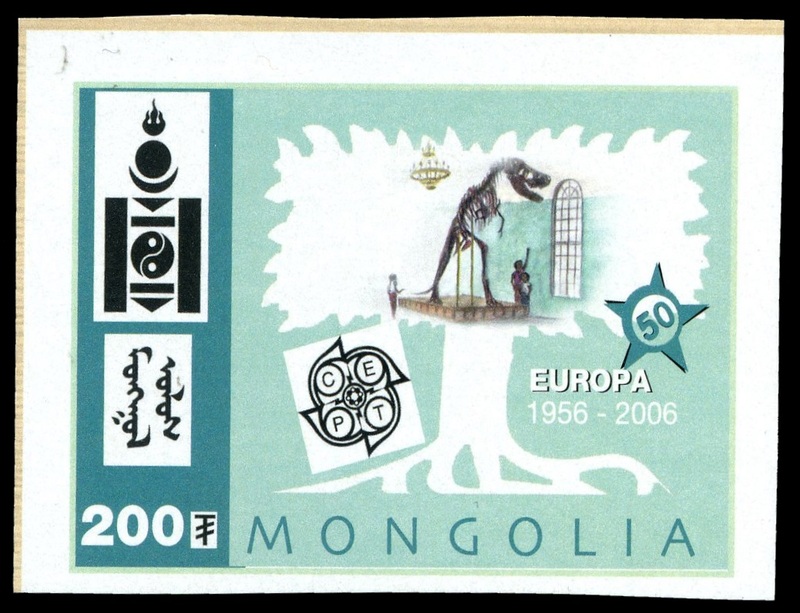 In October 2000 Post Authority of Mongolia issued a mini sheet with 17 stamp with a subject "Millennium of Exploration". Even on the fist look it is possible to identify some oddities there: some stamps, especially on the bottom side have different design and are more colorful than most of the stamps on the upper side of the sheet. Another strange stuff is the text on the left side of the sheet - all about Charles Darwin: his life, voyage on HMS Beagle around the world his explorations, theory of evolution, but many stamps have nothing to do with Darwin. Skull of theropod dinosaur, perhaps Tarbosaurus bataar, most famous dinosaur of Mongolia, shown on the first stamp in the second row. Only few Dinosaur species were known at Charles Darwin time. Fossils of Tarbosaurus are discovered in 1946, 64 years after Charles Darwin's death. Przewalski's hors, ram, duck, turkey and marbled are inhabitants in Mongolia, but have nothing to do with Darwin too. 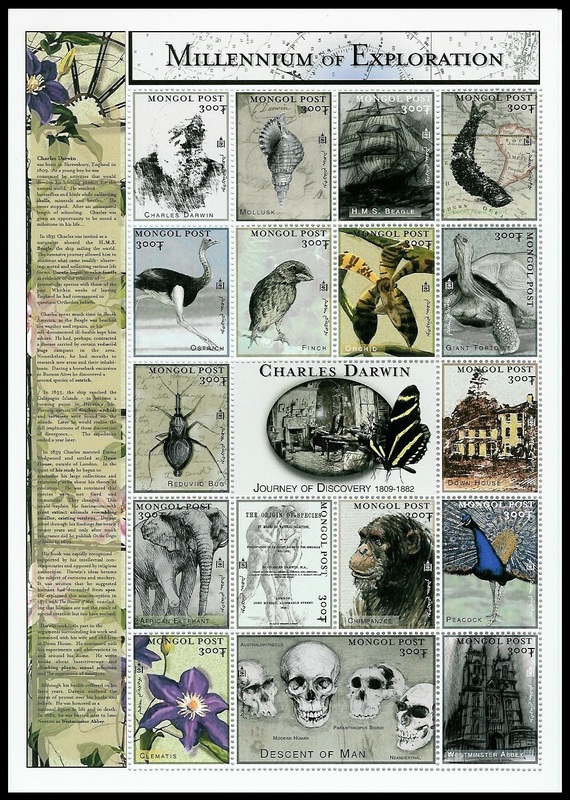 Initially, different set of stamps are planed for the issue (see image in the middle) - all about Charles Darwin's life, every stamp correspondent to a paragraph on the left side of the sheet when all stamp are designed in the same style. For some reasons 7 out of 17 stamps are replaced on the last moment to stamps that have nothing to do with Darwin but represent modern and prehistoric fauna of Mongolia. Only few original mini sheets are survived, perhaps it is a part of small production uses for stamps and design confirmation. These stamps are extremely rare and not listed in stamps catalogs. Many thanks to my friend Peter Brandhuber for information about this issue and his article (on German) about the sheet. [A1] In December 1980 Mongolia issued set of 8 stamps and a block of "Antarctic Animals and Explorarition". 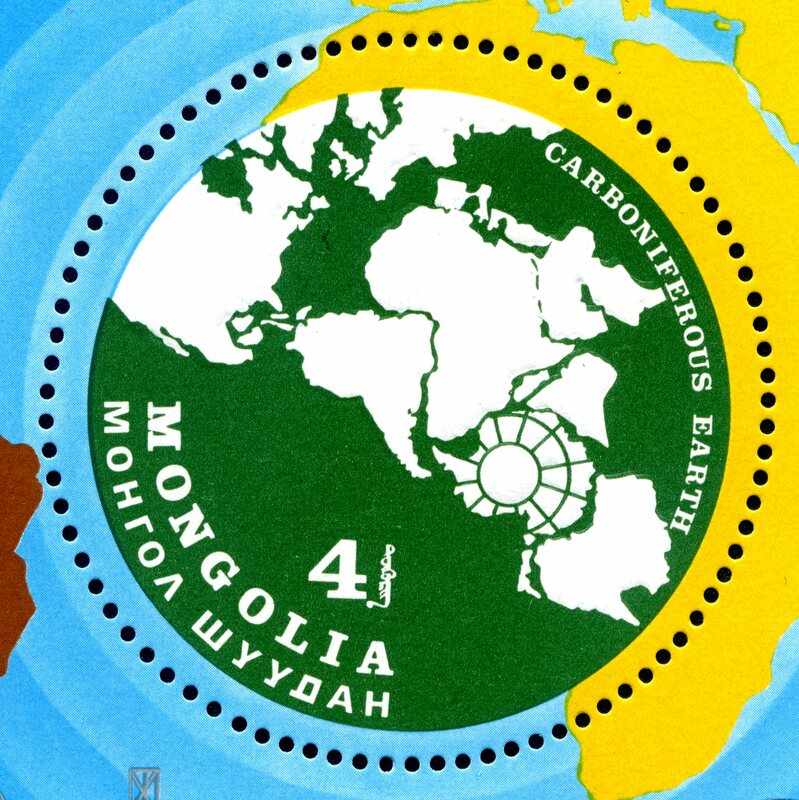 The round stamp in the block is dedicated to continental drift and shows world map at Carboniferous period. The Carboniferous Period lasted from about 359.2 to 299 million years ago during the late Paleozoic Era. The term "Carboniferous" comes from England, in reference to the rich deposits of coal that occur there. These deposits of coal occur throughout northern Europe, Asia, and midwestern and eastern North America. A major marine and terrestrial extinction event occurred in the middle of the period, caused by climate change.The later half of the period experienced glaciations, low sea level, and mountain building as the continents collided to form Pangaea. The Carboniferous was a time of active mountain-building, as the supercontinent Pangaea came together. The southern continents remained tied together in the supercontinent Gondwana, which collided with North America–Europe (Laurussia) along the present line of eastern North America. More info are on Wikipedia, University of California websites. [A2] Human evolution sequence and some cave paintings are shown on a sheet margin at the top-left corner.